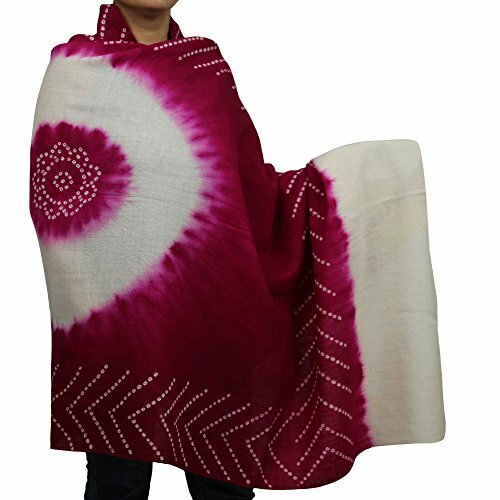 Red-Violet Cream Women’S Accessory Indian Woolen Shawl Tie-Dye Handmade 36 X 80 by ShalinIndia at SCRHI. MPN: MPN-tdswl_67. Hurry! Limited time offer. Offer valid only while supplies last. A traditional yet timeless shawl that at once makes you feel warm and comfortable on the one hand, and gives classy and elegant look on the other. A traditional yet timeless shawl that at once makes you feel warm and comfortable on the one hand, and gives classy and elegant look on the other. This 100% handmade woolen shawl is a creation of a very enterprising tribe living in the state of Gujarat in India. Rabari tribes who are credited with creating these shawls manage a complex symbiotic relationship with other communities in the region. Rabaris first get the weaving done by the Marwada Meghwal Harijans. Then Khatri crafts people carry out tie and dye printing. Finally Rabaris themselves execute embroidery and also market the product in their own region. Add this tribal masterpiece to your wardrobe and enjoy wearing it for many years to come.